The Canon ImageRunner line of all-in-one copier / printers provide exceptional quality and performance. The model packs a great deal of productivity and technology into a convenient, compact design. But what happens when the drum, magnet roller, charge roller or wiper blade gets damaged or worn out? New drums cost well over $100 USD. This can quickly add up and add significant cost to your business. 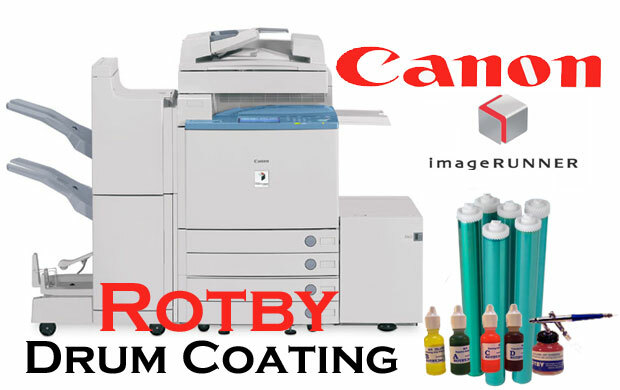 All Canon ImageRunner toner cartridges, including the drums, magnet rollers, charge rollers and wiper blades are fully compatible with the Rotby System. The Rotby System is able to restore damaged drums that are scratched, chipped or just worn out. The coated drum will have a flexible finish that will not crack under pressure. When the coated drum is used, the Rotby layer gets consumed leaving the original Canon layer intact. Once the Rotby Layer is used you can re-apply and use the same drum forever. Coating a Canon ImageRunner drum with the Rotby System can cost as little as $1.00 USD per drum. That is a savings of over 100,000%! Trust Rotby to extend the life of your Canon drum. Do you have questions about our product offerings? Contact one of our sales associates at [email protected]. Our professionals are waiting to assist you. Exclusive Offer: FREE Drum Coating Training! Learn the secrets that drum manufacturers don’t want you to know!